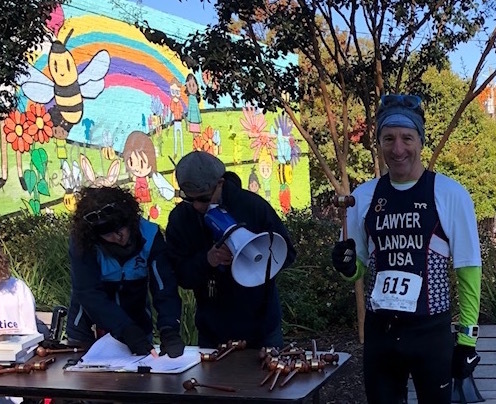 While in Georgia for a law meeting with some of the best lawyers from all over the United States, attorney Doug Landau found a local charity race to participate in on Saturday. 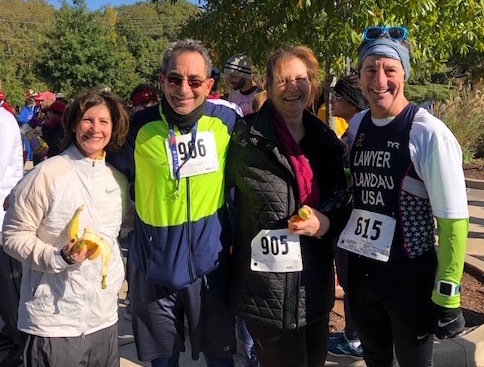 Whenever lawyer Landau travels for his cases, clients and continuing legal or medical education courses, he generally finds a race to compete in, as well as friends to visit, and new places to explore. Landau notes, “I like to be efficient, combine travel with exploration, adventure and athletic competition.” Hence the “Races, Cases, Places & Faces” subtitle for this website. 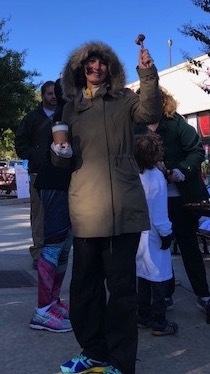 The Atlanta Legal Aid Society held its 28th “Run for Justice” in the Oakhurst neighborhood, on a sunny, frigid morning. The event benefitted the general operating fund of the Atlanta Legal Aid Society. Joining last minute entrants Melissa and Doug Landau were Georgia mediator and attorney Henry “Hank” Kimmel and his wife and writer, Barbara. Participating as team “Abrams Landau, Ltd.,” the quartet all gave full value, but had to leave before the team awards were announced. Families, corporate, church, school and community teams were well represented, including a large team of mediators. Sponsors included court reporters, The Daily Reporter and numerous Georgia law firms. The participants enjoyed the hilly, beautiful 5K course that began and ended at the One Step at A Time running shoe store in Decatur, Georgia. The crisp autumn day was enjoyed by runners of all ages, 5K walkers, families and children. Jogging strollers, kids and pets were welcome. In fact, a jogging stroller finished with a time of 18:25! The age group awards were judges gavels, perfect for lawyer Landau, who uses a gavel frequently when preparing clients for their “day in court.” Melissa Landau won a prize for her age group. All the members of the ABRAMS LANDAU team walked the last mile in with Barbara Kimmel, as it was her first race of the year. Lawyer Landau and Mediator Kimmel had become fast friends at The Hotchkiss School, where they logged lots of miles running in the woods of Lakeville. 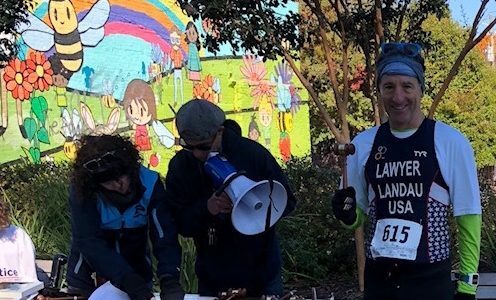 In fact, while he is a top Georgia tennis player and instructor, the multi-talented Hank Kimmel rarely runs and almost never races, especially after some debilitating injuries and a recent hip replacement surgery. However, when Landau is in town, he is able to prevail upon his long-time friend and they have run in some unusual venues and events in and around Atlanta. 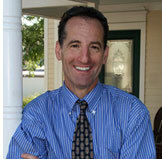 “Hank taught me how to meditate while running and we both experienced the ‘joy of running’ back in the ’70s and ’80s all over New England.” Georgia attorney Kimmel knew many of the participants because of his work in the courts, his CLE teaching, as well as his playwriting and tennis accomplishments. Lawyer Landau managed to finish 13th out of over 900, winning his category and having a new gavel to bring back to the Landau Law Shop. So watch out clients; Landau has a new hammer with which to rap on his conference room table in imitation of the judges you may appear before during the trial of your injury, workers comp and/or Social Security Disability case! Order in the Court! Your lawyer may be able to “hammer” most other lawyers in the court AND at the races.